In my previous article I explained how to install and Exchange 2013 Edge Transport server and how to create and activate the Edge Synchronization process. In this blog post I’d like to explain a bit more how to configure Message Hygiene on the Edge Transport server. The only possibility to configure the Exchange 2013 Edge Transport server is by using the Exchange Management Shell (PowerShell). There’s no GUI available for managing the Edge Transport server. The bright side of this is that there’s no IIS anymore on the Edge Transport server and that the attack surface of this server is smaller, something that’s important when connecting a server directly to the Internet. The Edge Transport Server works with so called Transport Agents. You can retrieve the Transport Agents by running the Get-TransportAgent cmdlet in EMS. Please note that all Transport Agents are enabled by default and are configured with default settings. In this blog I’ll discuss Reverse DNS (not listed above), IP Block List Providers, Content Filtering and SenderID Filtering. Some SMTP server perform a Reverse DNS lookup when an SMTP server tries to deliver a message. Although not an Exchange feature it still is important to discuss here. Note. There are mail server that greylist or even block a message when the PTR message doesn’t match or isn’t available! It is also possible to add IP addresses from sending SMTP servers to an IP Allow List, sometimes also referred to as White List. If a connection passes the IP Block List then the IP Allow List is evaluated. If the Send SMTP server is on this IP Allow List, the message is stamped with an SCL (Spam Confidence Level) of “-1” and the message flows ‘freely’ through the Exchange 2010 environment. 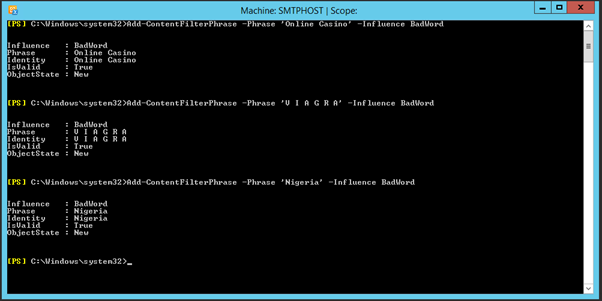 Content Filtering also works with an SCL or Spam Confidence Level. This number identifies the likelihood an email message is spam. An SCL rating of “9” means the message is most likely spam, an SCL rating of “1” means the message is a legitimate email message. 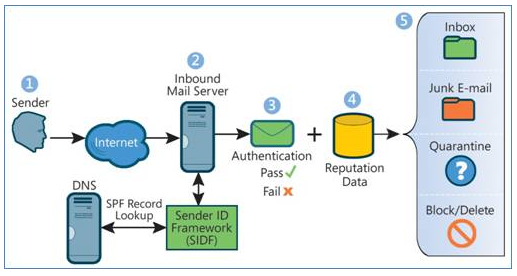 Sender ID Filtering is a DNS based filtering technique where the receiving SMTP server (in our case this is our Exchange 2013 Edge Transport server) checks for certain DNS records (called SPF records) of the sending organization. Depending on this results the receiving server rejects the message, stamps it with an additional message header or just forwards it to the Mailbox. The SPF record (a TXT record can be used as well) is registered in public DNS of the sending organization, and this is checked by the receiving mail server. If other parties want to implement Sender ID, we have to enter an SPF record in public DNS as well. This record contains a reference to the IP addresses of the servers that are allowed to send messages from our domain name. 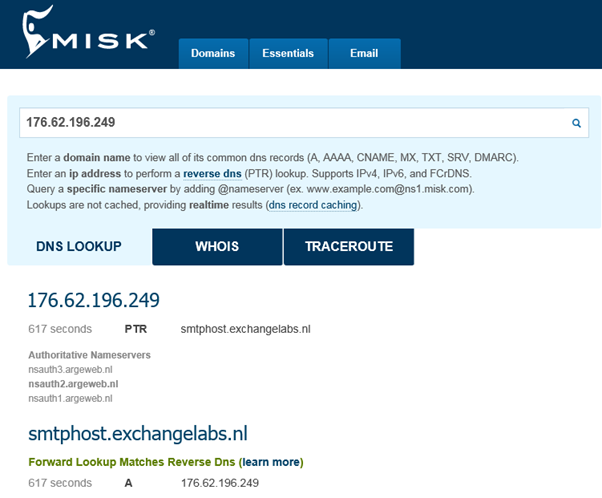 For example, my Edge Transport Server is sending SMTP messages from the ‘exchangelabs.nl’ domain and this is the only server that’s allowed to send messages from this domain. If other SMTP servers are sending messages using this domain it is most likely spam. 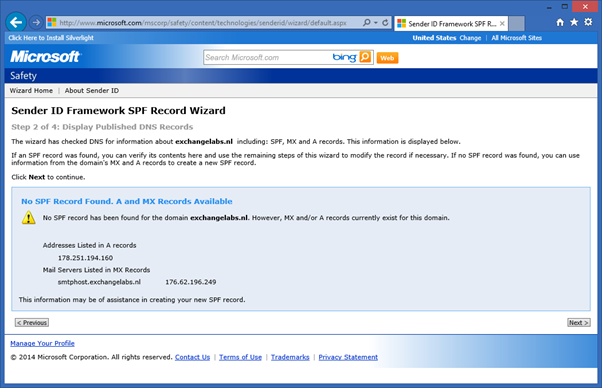 To create an SPF record Microsoft has a wizard available on their website that you can find on http://bit.ly/SenderIDWizard. The third step is to enter details about the sending SMTP server that the wizard uses to create the actual SPF record. 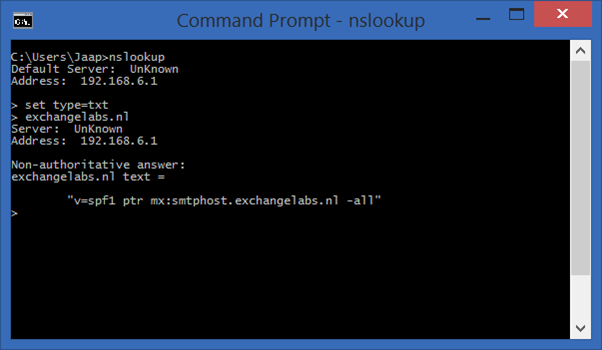 In my example the only server allowed to send mail is the smtphost.exchangelabs.nl server and this option is checked in the wizard. Since I also have a valid PTR record for my Edge Transport Server I can check the All PTR records resolve to outbound email servers option under Reverse DNS Lookup. 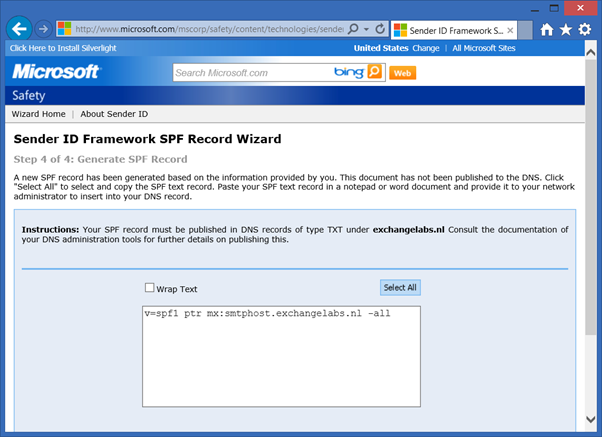 In the last step the value for the SPF record is shown. This value should be entered in public DNS. Once entered you can check its availability using the NSLookup utility. 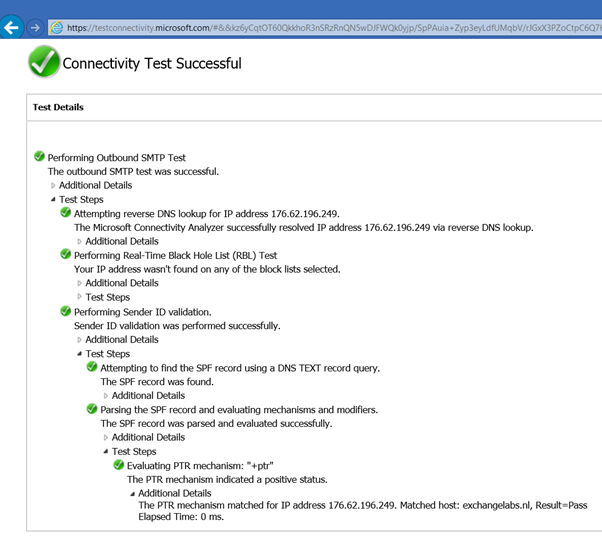 Thus far I’ve shown you how to configure the SPF record you have to use in your public DNS for your SMTP domain. The next step is to configure SPF on our Edge Transport Server. StampStatus – this is the default settings. It stamps an additional header on the message and the server continues processing. Reject – This option returns an NDR to the sender, notifying him or her that something is wrong. Delete – This option deletes the message without returning an NDR to the sender. In this case when it is a legitimate sender he never knows the message got lost. 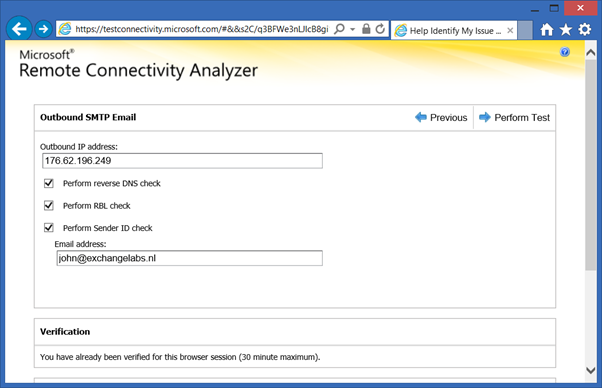 The easiest way to test your Edge Transport server is to start sending email. You can also use the Remote Connectivity Analyzer (www.testexchangeconnectivity.com) to test the environment. Open RCA in your browser and under Internet Email Tests select the Outbound SMTP Email option. At this point we have installed and configured the Exchange 2013 SP1 (well, actually it was CU5) Edge Transport Server and configured the most interesting features like Reverse DNS, IP Block List providers, Content Filtering with a Quarantaine mailbox and Sender ID filtering.